These jeans look very flattering. This new wrap top that comes in floral, prints, and solid colors. These camo sneakers (also in leopard print) for only $50. This pretty blush pink blouse. This sweater is on sale for $14 (originally $49). This $25 striped sweater dress. This new arrival leopard sweater. These cute gingham pumps are 50% off. This leopard tote is $8. This comfy sweater is over 40% off. This is my favorite tee. I like this pretty white dress for $57. This new arrival $25 sweater. This little black dress for $25. Blush and white is all the Spring sweetness! Love it, have a wonderful day! I just love this neutral look! 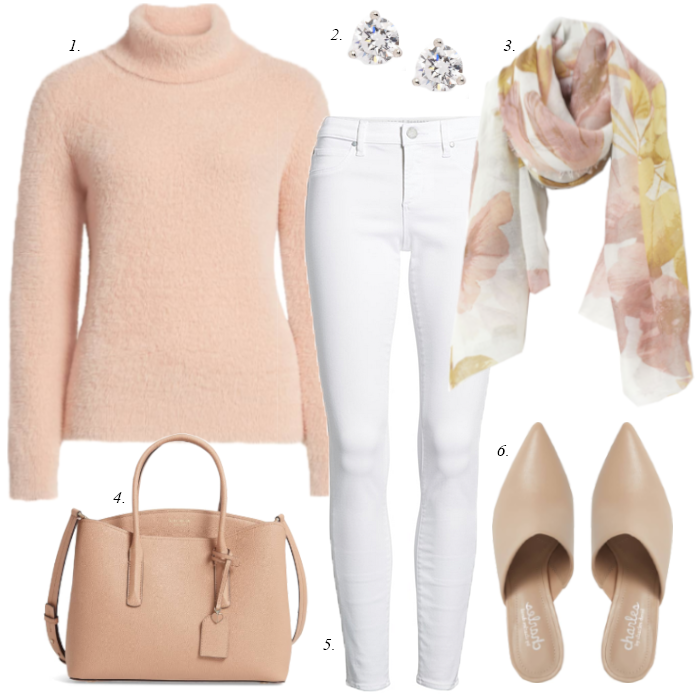 Blush is so popular right now and it just pops with the white jeans! Enjoy your Wednesday! I'm wearing blush today so I was immediately drawn to this post. The sweater is so pretty with the white jeans. Well, now I need a pink sweater like this! Your posts always make me want to shop! Ha! I LOVE that satchel, too! It's been on my wishlist for a bit and hoping to make it happen by Spring! I love that satchel, too! Aw, you're too sweet and I swear I could just do your outfit recreations and be the happiest fashionista alive. This whole outfit needs to find its way into my closet, but slip in under my Prince Charming's watchful eye. He says I have too many clothes. Have you ever heard of such a thing? I didn't know that was possible. And besides, I just purged a whole laundry basket full this week. I love turtlenecks...I think partially because I can tuck all of my double and triple chins beneath them! This one looks so cuddly and warm and that color is divine. Have pinned it and the scarf. Wish pinning things would make them yours! And your inspiration from Pink Peonies is lovely, too!! Hope you are well, friend. Have you opened your clothing line yet? It's so go to hear from you! I know - my husband says the same things. I do not believe we can have too many clothes. Love this whole outfit - now I need to recreate your recreate! I love blush and white together. I'd LOVE that KS satchel too - sooo pretty! I love that look! So pretty and I am going to get that scarf! Just so soft and feminine!